The What Hi-Fi? 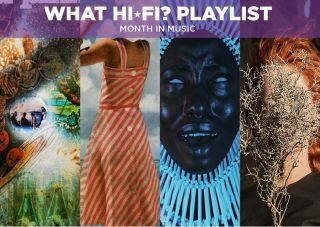 month in music - February 2017 | What Hi-Fi? As much as David Bowie, Nina Simone and every Hans Zimmer soundtrack ever made have become staple listening material in our testing rooms, we at What Hi-Fi? are always eager to discover, or rediscover, new and old music – an easy feat nowadays thanks to music streaming services. Nothing in the line above says anything about forsaking Floyd’s earlier works, however, which, despite long preceding the band’s legacy albums, are currently enjoying a renaissance since the release of the band’s 27-disc The Early Years 1965-1972 boxset (and BBC documentary, Pink Floyd Beginnings 1967-1972). Rather than forking out the £400 asking price, purchase the more affordable 2CD highlights album instead, and peddle back past Dark Side, Wish You Were Here and The Wall to the Barrett-era sophomore album A Saucerful of Secrets, which marks the late musician’s final contribution to the band, and Gilmour’s first. Despite being the only studio album in which all five band members appear, it isn't just an emblem of the both physical and creative crossover phase, but a fossilization of the band’s psychedelic ‘acid’ rock vibe that would be deeply rooted in the next few albums, and famously become their blueprint musical heirloom. Ultimately with Roger Waters' bass lines (Let There Be More Light), the misanthropic humour in Barrett’s tragic, yet poppy, Jugband Blues, the debut of Waters’ lyrical war theme in Corporal Clegg, and the recurring prolonged passages of spacey instrumentation, Saucerful is more or less a handbook for discovering Floyd’s artistry and musicianship. Childish Gambino is unlikely to be well known on this side of the Atlantic, but it's the musical stage name of actor, writer, producer, rapper and DJ, Donald Glover. Normally when someone has a foot in so many disciplines, it’s something to be wary of. Fine comedian though he is, Glover’s previous albums have been disappointing, as his rapping style left you struggling to connect with the music. Not so with his latest Awaken, My Love. A throwback to the funk albums of the 70s, this is a deliciously styled effort. The first half is full of energy, the highlight being Boogieman, a song that explodes with momentum, a terrific beat and a chorus that will have you nodding your head and tapping you toes. The second half gives way to slower-paced songs such as California and Terrified and despite some clever lyrics, they don't quite touch the high points of previous tracks. Arguably Awaken is an exercise in style and mimicry and not original in any way. However, like good soul/funk music, this about how it makes you feel, and on that level Awaken works. It’s slick, inventive and enjoyable. Get your funk on. Two years might not seem like a long time, but for someone in their early twenties, it's an absolute age. So, enter Future Islands and their 2014 album Singles. That the lead single Seasons (Waiting on You) was picked as the best track of 2014 by NME and Pitchfork makes missing it then even more shameful. Nonetheless, the mix of bubbly synths and throat-wrenching pseudo-screams of Samuel T. Herring’s lyrics is enjoyable at any time. Combined with punchy bass drums, Future Islands create a soundscape that pops and crackles like an electric fire, going from a calming, serene sound to a gut-wrenching howl in an instant. The best example is Fall From Grace, which is fairly indicative of the rest of the album. And, in a year when the world has broken all its established rules and gone to hell in a hand basket, it’s cathartic to have something other than the TV to yell along with. Rapidly deciding their lush, enormo-selling 1982 debut The Lexicon Of Love was a millstone, ABC followed it with the self-conscious guitar posturing of 1983’s Beauty Stab. And having thinned out their audience quite considerably, they made another stylistic leap with 1985’s How To Be A… Zillionaire! Adopting a Jackson 5-aping cartoonish persona (which would be appropriated soon enough by the likes of S’Express and Deee-Lite) and the beat-box-y, hip-hop-centric rhythms and sounds of the embryonic acid house scene, the ABC of 1985 were trying altogether too hard. Sure enough, critical response ranged from ‘dismissive’ to ‘embarrassed’, and ABC were written off as a one-trick pony. And yet. It’s true half of How To Be A… Zillionaire! sounds tragically dated but, when Martin Fry’s considerable melodic gifts come to the fore, there’s plenty to admire. Between You And Me and Ocean Blue, for example, are the sort of incorruptible pop songs that are overdue a punishing on Britain’s Got Talent or whatever. The almost-title track How To Be A Millionaire is sturdily danceable by mid-80s standards, while the second half of thumping centrepiece 15 Storey Halo is as instinctively pretty as anything the 80s threw up. Don’t expect How To Be A… Zillionaire! to be rehabilitated any time soon – the drum sounds alone are enough to make it sound like a lumpy relic. But it has gifts to give, and is thoroughly worth the occasional revisit. A new Goldfrapp album? One thing’s for certain: nothing’s for certain. The duo’s insistence on mining a separate seam for each new release does mean the occasional lump of coal in among the diamonds – but when Alison Goldfrapp and Will Gregory get it right, they absolutely nail it. What we will get for sure from Silver Eye (due for release on 31st March) is a finely crafted set of songs with beautiful melodies enhanced by Alison Goldfrapp’s haunting vocals. And, for those regular glimpses of light in the forest clearing, we’re more than willing to risk the occasional bend in the road.